If you are looking for a simple, quick and painless guide to implement in app purchase in your Android app, you have found the right place. Thanks! But what if I want to sell… Hmmm… A hat?… Or no, guess what! A premium upgrade! Crazy idea I know! Great for testing fake purchases, but nothing on buying your own specific products that come with a unique ID! I guess it’s fun for the reader to figure this out. This one is better. Buy why is the author only giving portions of the code to add? And where should it be added? It’s like “hey, I know how to do it, so I will tell you 75% of it, because I am sure the other 25% will bring you a lot of joy and happiness to figure out yourself. Oh and also I love to change method names from the official Google doc. So when you use both code it’s a real delight“. And why several activities when you can only deal with one for your test? Wtf… What is a beginner gonna do with these unreferenced methods? I guess I am just being sarcastic. These guys are doing a good job at helping out the community. So kudos to them. 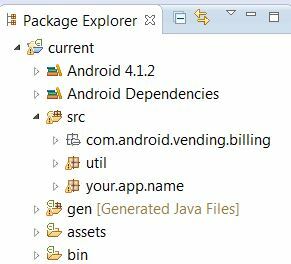 That’s why I wanted to give you a really simple, exhaustive and quick android in app billing, I hope it helps. I am assuming you use Eclipse. Also this guide only covers managed iap (selling an upgrade to get rid of ads for example, a very common micro transaction). Unmanaged iap is not very different, you only have to consume products and that’s super simple. It is always good to have a proper example to mess with. It’s called TriviaDrive, it’s made by Google and it’s a good example to understand the basics, and to get some util files to copy in Eclipse (see step 8). Of course Google likes to make it complicated, by downloading the stuff through the Eclipse SDK manager. Perfect to loose the folder on your drive… What’s wrong with a good old zip file download? Add the Google lib into your src files. The official doc is not clear, so here is a great and simple guide to do it quickly without pain. Check this cool article out. Just as a reference, you can do your own mojo! // Does the user have the premium upgrade? String base64EncodedPublicKey = "<your key>" you can find it in your Google Play console, in the API section. // Oh noes, there was a problem. // Hooray, IAB is fully set up! Log.d(TAG, "onActivityResult(" + requestCode + "," + resultCode + ","
At this point you must have a lot of red in your code. That’s fine, that’s because you have not added the util files yet. These are helper files you don’t need to modify. In the sample app I have provided in the step 0, go to the folder TrivialDrive\src\com\example\android\trivialdrivesample, copy the bunch of folders and paste them into your src/util folder. Make sure you edit the package names correctly according to your path. You’re done. Just wait a couple of hours for Google Play to integrate the last version of your apk in its server. Once again, sorry for the rant against other tutorials. Most likely they are just trying do help you guys out there like I am. But sometimes, you end up on a tutorial where clearly the author hides some portions of the code just because he wants to “educate” readers to learn by themselves, go to amazon and buy a freakin 400 pages java book, and spend the week end having fun playing with the Eclipse settings. Well guess what, the Internet is based on shortcuts. That’s why I hope you’ll find this post useful.